"For thy name's sake do not give us up utterly, and do not break thy covenant, and do not withdraw thy mercy from us, for the sake of Abraham thy beloved and for the sake of Isaac thy servant and Israel thy holy one, to whom thou didst promise to make their descendants as many as the stars of heaven and as the sand on the shore of the sea. "For we, O Lord, have become fewer than any nation, and are brought low this day in all the world because of our sins. And at this time there is no prince, or prophet, or leader, no burnt offering, or sacrifice, or oblation, or incense, no place to make an offering before thee or to find mercy. "Yet with a contrite heart and a humble spirit may we be accepted, as though it were with burnt offerings of rams and bulls, and with tens of thousands of fat lambs; such may our sacrifice be in thy sight this day, and may we wholly follow thee, for there will be no shame for those who trust in thee. "And now with all our heart we follow thee, we fear thee and seek thy face. Do not put us to shame, but deal with us in thy forbearance and in thy abundant mercy. Deliver us in accordance with thy marvelous works, and give glory to thy name, O Lord! 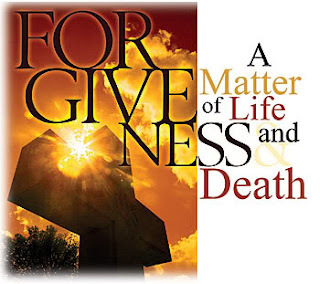 Peter came up and said to Jesus, "Lord, how often shall my brother sin against me, and I forgive him? As many as seven times?" "Therefore the kingdom of heaven may be compared to a king who wished to settle accounts with his servants. When he began the reckoning, one was brought to him who owed him ten thousand talents; and as he could not pay, his lord ordered him to be sold, with his wife and children and all that he had, and payment to be made. So the servant fell on his knees, imploring him, `Lord, have patience with me, and I will pay you everything.' And out of pity for him the lord of that servant released him and forgave him the debt. "But that same servant, as he went out, came upon one of his fellow servants who owed him a hundred denarii; and seizing him by the throat he said, `Pay what you owe.' So his fellow servant fell down and besought him, `Have patience with me, and I will pay you.' He refused and went and put him in prison till he should pay the debt. "When his fellow servants saw what had taken place, they were greatly distressed, and they went and reported to their lord all that had taken place. "Then his lord summoned him and said to him, `You wicked servant! I forgave you all that debt because you besought me; and should not you have had mercy on your fellow servant, as I had mercy on you?' And in anger his lord delivered him to the jailers, till he should pay all his debt. "So also my heavenly Father will do to every one of you, if you do not forgive your brother from your heart." How often shall I forgive? [...] at the demarcation line between the trials of fire and the beguilement of old habits, stands this absolute condition which God never relaxes: as you forgive, the measure which you use will be used for you; and as you forgive, you will be forgiven; what you do not forgive will be held against you. It is not that God does not want to forgive, but if we come unforgiving, we check the mystery of love, we refuse it and there is no place for us in the kingdom. We cannot go farther if we are not forgiven, and we cannot be forgiven as long as we have not forgiven everyone of those who have wronged us. This is quite sharp and real and precise and no one has any right to imagine that he is in the kingdom of God, that he belongs to it, if there is still unforgiveness in his heart. To forgive one's enemies is the first, the most elementary characteristic of a christian; failing this, we are not yet christian at all, but are still wandering in the scorching desert of Sinai. [...] But to be able to say 'Forgive as I forgive' is [...] one of the greatest problems of life. Thus, if you are not prepared to leave behind you every resentment that you have against those who were your overlords or slavedrivers, you cannot cross. If you are capable of forgiving, that is of leaving behind in the land of slavery, all your slavish mentality, all your greed and grasping and bitterness, you can cross. After that you are in the scorching wilderness, because it will take time for a free man to be made out of a slave. All that we possessed as slaves in the land of Egypt we are deprived of - no roof, no shelter, no food, nothing but the wilderness and God. Earth is no longer capable of feeding us; we can no longer rely on natural food, so we pray 'give us day by day our daily bread'. God gives it even when we go astray, because if he did not we should die before we could reach the border of the promised land. Keep us alive, O God, give us time to err, to repent, to take the right course. and ever obtain thy help for our every need.